This Science News’ story, Neanderthals reveal their diet with oldest excrement caught my eye. The shifting and mixed opinion on diets finally drove me in the late 70’s to look outside the box and seek insight from nature for clues to the optimum diet for our species. I spent weeks at the central library in Stockholm, Sweden, digging up all the information I could find. Knowing that we are one of the four great apes, I decided to research the diets of our three brother apes, orangutans, gorillas, and chimpanzees. As I recall, they all forage from a selection of around 200 different plant species. While the first two are utter vegetarian, Jane Goodall discovered a slight difference in the chimpanzee diet. Come to find out, they eat insects and even larger animals that they have hunted and killed themselves. However, the vast bulk (98%) is made up of a wide variety of plant foods including fruits, seeds, nuts, leaves and flowers. Like us, they are omnivores. (see, Biology & Habitat). I’ve always trusted nature’s empirical example more than ‘expert human opinion’. This led me to conclude that we great apes evolved to eat a diet composed largely of fresh vegetable matter. I made up a chart to see how each of three ‘pure diets’ would fair vis-à-vis our core vitamin and energy (caloric) requirements. The chart compares three simple diets: 100% Meat, 100% Grain and 100% Vegi. These results made complete sense, although given modern circumstances and desires it certainly isn’t practical as our sole diet. Nevertheless, the further back we look in “Genus Homo” history (our branch of the great ape family tree), the more vegetable matter our diet turns out to contain. It was only through advances in hunting tools beginning about 100,000 years ago, that our diet became much more meat oriented. See Science News’ Going Coastal: Sea cave yields ancient signs of modern behavior. Then, with the onset of the agricultural revolution just 10,000 years ago, our diet became overwhelmingly grain oriented. Study the three diets above closely. You’ll see that if you were limited to one of them exclusively, the vegetable diet is the only one upon which a modern human could actually survive. If the meat diet included the whole animal, including stomach contents, it would at least permit survival. See Science News’ Neanderthals ate stomach goop, and you can too (1). While perhaps not practicable to eat vegetables exclusively, it tells me to eat as much fresh vegetable matter as possible. This Science News’ story, Neanderthals reveal their diet with oldest excrement, supports some basic aspects of the so-called paleodiet popular today. As usual with most things humans do, we tend to go to extremes. I imagine our ability to think causes this slide to extremes. This must be one symptom of our “disease”, i.e. Realizing I don’t know is better; not knowing this knowing is disease. This also helps explain why, in our search for ‘answers’, we walk right past the obvious. And I would add, they were not living the way their ancestors were. The Neanderthals were eating their own iteration of junk food, although, nothing as junky as modern humans are capable of eating. (1) Here is a excerpt from this ‘stomach goop‘ article. But now anthropologists Laura Buck and Chris Stringer of London’s Natural History Museum suggest in Quaternary Science Reviews that instead, Neanderthals may have picked up some of these plants by eating the stomach contents of their prey. That would explain the presence of plants with no obvious nutritional value to hominids. Only in today’s warped food scene could people refuse to eat anything but boneless, skinless chicken breasts. The Inuit traditionally ate reindeer chyme because it was a source of plant matter, a rare commodity in their environment. Eating nothing but protein can be toxic, so letting the reindeer do the hard work of finding all the most tender mosses and lichens is pretty smart. The KhoeSan eat porcupine stomach because of the animals’ diet of medicinal plants. 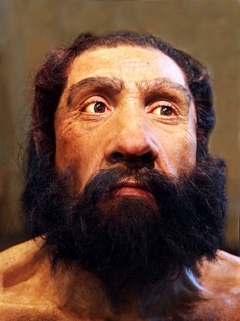 For a more complete review of the Neanderthal diet, see Quaternary Science Reviews’ Having the stomach for it: a contribution to Neanderthal diets? Funny but I was just thinking is morning about how cats can produce their own vitamin C. So if you’re ever somewhere with no access to fruits and veggies, think about what your cat has done for you lately.